A mildly acidic detergent cleaner and rinse agent which can be applied by sprayer or extraction machine to help prevent most colour bleed and cellulosic browning on susceptible carpets and fabrics. Fibre & Fabric Rinse is ideal for use on wool carpets, oriental rugs, cotton and natural fibre upholstery fabrics as well as all types of synthetic fibres. Helps to prevents most colour bleed, yellowing and browning. Conditions all natural and synthetic fibres. Effective for neutralising urine contamination and odours. Orange liquid with fresh orange peel fragrance. 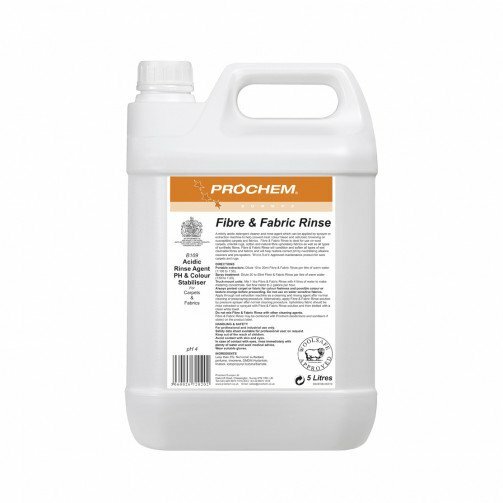 Fibre & Fabric Rinse will condition and soften all types of wet cleanable fibres and fabrics and will help restore correct pH by neutralising alkaline cleaners and pre-spotters. WOOLSAFE approved maintenance product for wool carpets and rugs. For professional and industrial use only. Portable extractors: Mix 10 to 20ml Fibre & Fabric Rinse per litre of warm water (1:100 to 1:50). Spray treatment: Mix 20 to 50ml Fibre & Fabric Rinse per litre of warm water (1:50 to 1:20). Truck-mount units: Mix 1 litre Fibre & Fabric Rinse with 4 litres of water to make metering concentrate. Set flow meter to 2 gallons per hour. Always pre-test carpet or fabric for colour fastness and possible colour or texture change before proceeding. Do not use on water sensitive fabrics. Apply through soil extraction machine as a cleaning and rinsing agent after normal cleaning or pre-spraying procedure. Alternatively, apply Fibre & Fabric Rinse solution by pressure sprayer after normal cleaning procedure. Upholstery fabric should be rinse extracted or sprayed with Fibre & Fabric Rinse solution and then blotted with a clean white towel. Do not mix Fibre & Fabric Rinse with other cleaning agents. 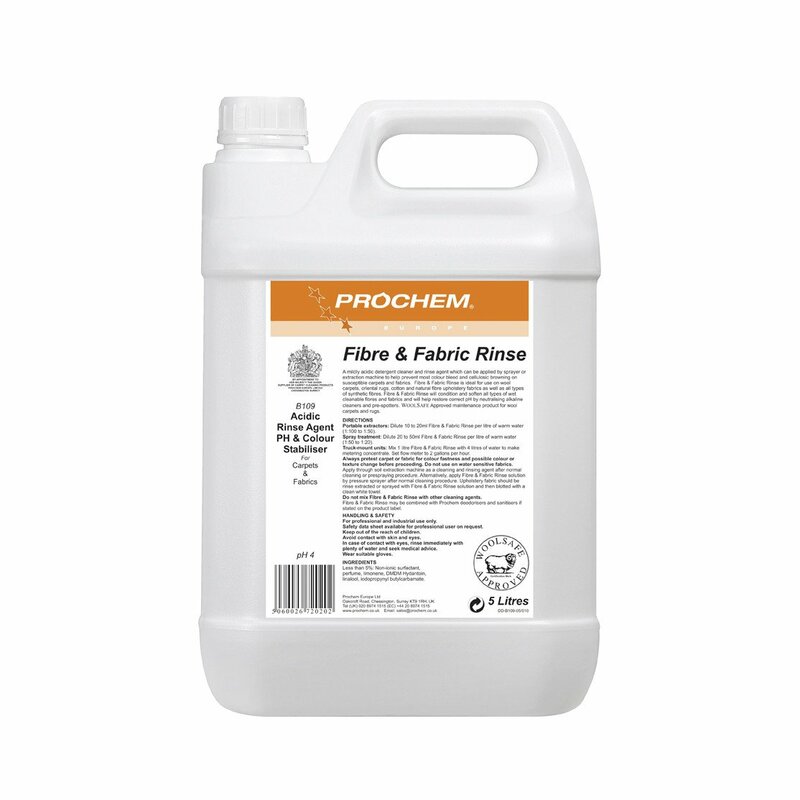 Fibre & Fabric Rinse may be combined with Prochem deodorisers if stated on the product label.